Here's your morning roundup for Feb. 28, the day an ESPN cameraman may have lost a job. 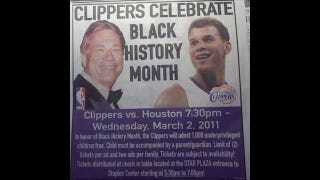 • In honor of Black History Month, Donald Sterling will admit 1,000 "underprivileged" kids and their parents in free for a Clippers-Rockets game on Wednesday. It is unclear exactly how the Clippers will determine a child's "privilege" status, but we have one guess. • In some Sunday NBA action, the Knicks beat the Heat 91-86, thanks to some late-minute heroics by that other guy, Chauncey Billups, and an epic block from Amar'e Stoudamire. Kevin Durant and James Harden both got a shot at tying the Lakers in Oklahoma City, but both last-minute three attempts were off the mark, and L.A. won, 90-87. Also, Kevin Love had 30 points and 23 rebounds in a 126-123 win over Golden State. Numbers, indeed. • This past week, social media was responsible for both the total destruction of the Oscars and for Hoopism expanding its video collection of the greatest NBA shots of all-time, from 65 to 100 total. They're also deservedly getting a mention in Sports Illustrated this week. • Steven Davies, the wicketkeeper for England, announced in a 15-minute video interview with The Telegraph that he is gay. He is the first cricketer to come out publicly. This will also serve as your weekly reminder that the Cricket World Cup is underway in India for the next four weeks. • Hall of Famer Edwin Donald "Duke" Snider, known also as "The Duke of Flatbush" or "The Silver Fox," passed away yesterday at 84 years old. Snider was with the Dodgers from 1947 to 1962 and helped Brooklyn win its only World Series title, in 1955. He won another in Los Angeles in 1959. "Probably, no more graceful player ever stepped into a batter's box," Jim Murray wrote for the Los Angeles Times in 1988, the year Snider's children's book was released. "No one swung at a ball with the purity of form of Duke Snider... They used to stop what they were doing on the field to watch Duke Snider take batting practice." • Jeff Gordon won his first race in 66 attempts at the Phoenix International Race on Sunday. He said it was "amazing" to beat Kyle Busch, and continued a recent trend in NASCAR speechlessness: "I can't tell you how amazing this feels." • Everyone panic! Cam Newton is getting "mixed reactions" at the Combine. His "legs" are impressing but his "arms" are not. His "torso" seems to be holding it all together quite well. • Charlie Sheen is on a drug and the drug is called Charlie Sheen. A few recent posts you might've missed. Solutions: A smart proposal for expanding the NFL season: 18 weeks, not 18 games. Such a notion would not require any bending of the players' union to the owners' will, and therefore has no place at the negotiating table. Spirit: A cheerleader very nearly cost Louisville its upset victory over Pitt. "The male cheerleader is coming to an end," Rick Pitino snarked afterward. "It was good while it lasted." Nutshot: If you're unfamiliar with golf writer and golfcaster David Feherty, just know that he is reckoned a wit by the sort of people who mistake Jim Nantz for Edward R. Murrow, and that there is something very pleasing about watching a kid smack a golf ball directly into Feherty's nuts. Aww: John Wooden's great-grandson Tyler Trapani made the last shot in the last game at UCLA's Pauley Pavilion before the place undergoes a yearlong renovation. It was a fundamentally sound layup. Skip ahead to the :49 mark in the video here.